A cousin of mine who grew up in the city told me his dad and other Filipinos used to hang out around Kearney Street in San Francisco, right at the cusp of Chinatown. It was the only part of the city where Filipino and Chinese immigrants can live and gather freely without being harassed. 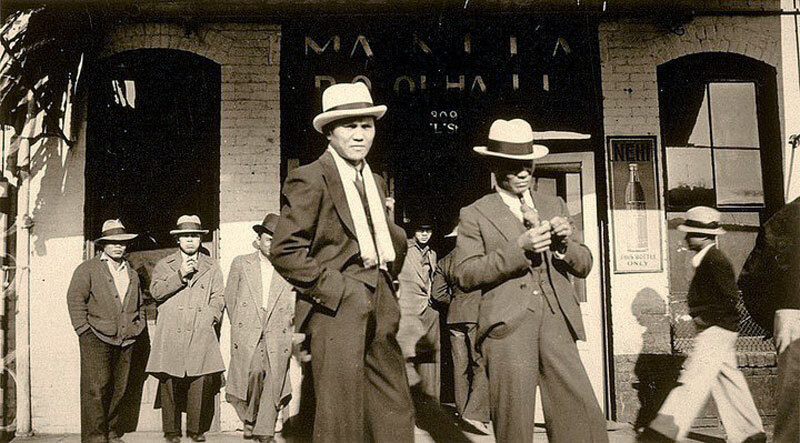 This area came to be known as Manilatown with a few Filipino restaurants, pool halls, barber shops, and a few single occupancy hotels that would allow Filipinos and Chinese to stay there. I remember my cousin talking about the Filipinos back in those days like they were some kind of gang. He referred to them as the Kearney Street boys. I think they were just barcadas (buddies) hanging out together watching out for each other's back. Many of my relatives came through San Francisco when first immigrating to America. Some came from Hawaii first then on to work the fields of central California and then seasonally up to Washington and Alaska to work in the fisheries and canneries. This picture was actually taken in Stockton California but there were a couple of Filipino pool halls on Kearny Street San francisco were Filipinos would hang out just like you see here. Many of the new immigrant Filipino men sent money and pictures home to assure their relatives that they're doing okay and living the American dream. 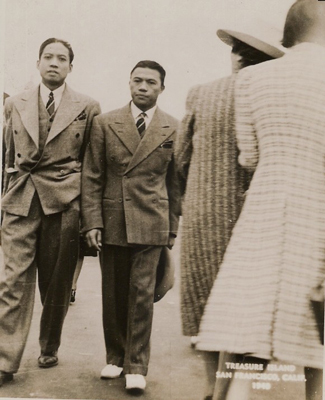 It seemed that most of the pictures from that time period had many Filipinos dressed up really nice in what looked like expensive suits. They always dress to impress posing for the camera. I knew a lot of them sent money and letters home with these photos to give the impression of how well their doing. Hiding the fact that they were unwelcomed. These were harsh time for everyone so believing in the American dream was the faith that kept them going. I remember hearing a story from one of my uncles who was in the Navy were he and his sailor buddies went to have dinner at the Cliffhouse restaurant at Ocean beach and were denied service because they were Filipino and not welcome there so they started a riot. My uncle ended up in the brig that night but made a statement that he was here as an American and deserved equal rights. He eventually became a career Navyman and applied for citizenship. These must have been trying times for them trying to fit into the American culture and experiencing the unpleasant sting of discrimination.